Every day I pop into groups, communities, and forums to help answer questions. Most all come from site owners who want to pick an expert’s brain for free. And most of the advice given is at best, and necessarily, generic. And then the post fills up with so many opinions from both experts and novices alike that nobody knows what’s best to do any more. The fact is, there are 14 ways to do anything. 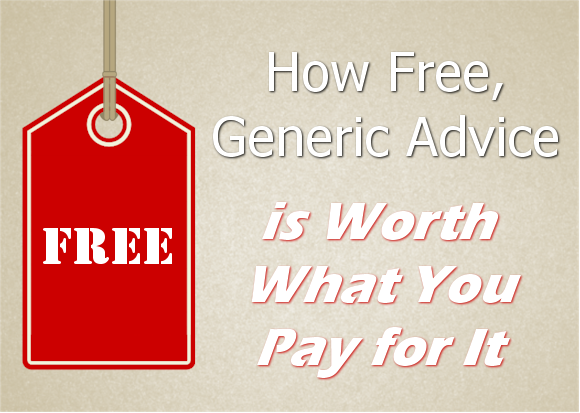 Find out why generic advice is not in your best interest and how to properly vet the person giving it, plus how to avoid it. I’ve seen some pretty amazing questions posed online. One sentence things like “How do I make money from my new website?” Or, “How do I build a site just like this one?” followed by a link to a $7000 design. Joost de Valk, the developer of the WordPress SEO plugin, has an attitude and is not afraid to show it. He draws a distinct line between users and customers. He doesn’t hesitate to snap at folks who post questions or issues on his plugin forum without them ever taking a second to see if they installed or configured the plugin correctly. Those folks, who have his free and amazing plugin on their sites, he considers users. And he dishes it back to them just as hard as they dig into him over something minor. With so much free stuff floating around, from WordPress software, to theme, plugins, and billions of blog posts and YouTube tutorials, the Internet has created a monster class of users who think that they are entitled to free and easy everything in their effort to make money on the web. Free everything includes tech support. There are millions of site owners who have not invested a dime in their site beyond hosting, or in their education of how to setup and run a site, and they are consistently asking for free help. They post questions in forums. And they give minimum info and expect someone to magically troubleshoot the problem, sight unseen. Or, their site has been hacked and they want to know what to do. And most didn’t even invest in a backup. In fact, a lot of site repair folks would be out of a job if all of the site owners that come to them had a backup. Problem solved in :15 minutes. Groups and forums are rife with questions from folks who want to know the best hosting, or best plugin for something. They rarely give details that would make all the difference in giving a decent answer. That includes why they are looking for new hosting and what their site needs are. Or, what other plugins they may already have that would conflict and what options they need. There are so many factors to site security and performance, and so many combos that work well, I literally dread anyone asking these questions on forums. It starts another long series of comments with each expert holding their opinion with verve. And none of those answers is a going to help the one asking because they are all too generic to know if it will be a good fit for that site owner. The only way to ensure that you get an answer to your site dilemma that will work well is to have someone actually look at your site and situation holistically. Contrary to popular belief, there is no expert that knows everything. Having a successful website has become a complex task of knowing hosting, security, WordPress, content, SEO, conversion, social media, email marketing, and so much more. I follow over 100 blogs a week just to try to keep up with this industry. Site owners who hired a social media expert who make it crazy easy to set up a site probably have some serious security and SEO issues. Site owners who hire a developer and focus first on a theme without regard to content probably have some serious marketing and conversion issues. There’s just too much to know now about how to make your site get found, read, and acted upon and stay safe. You can hire an agency that has teams of folks who specialize in each area of site success. Or, you can hire individual experts in each area. But what you can no longer do is expect to get real answers and real help for free and hodge-podge a site together with zero investment in your education and have success with that site as your 24/7/365 business partner. Just because someone knows a bunch of technical terms doesn’t mean they know what they’re talking about. Don’t be impressed so easily. Having a grip on industry jargon is not a sign of competence. Just because someone is good in one field that deals with computers or the Internet doesn’t make them good at doing anything else with it. I can’t tell you how many times I’ve had clients come to me with horrible sites built by their brother-in-law who works in IT. Same with clients who paid big bucks to a developer who built a site with super clean code but had yucky branding as well as bad SEO and conversion. If you’re going to act as your own general contractor, you better know everything there is to know about running a successful site before you pay anyone to build or setup anything. Otherwise, get the education you need first. I would trade my current salary for the money my clients spent before they came to me with what didn’t work plus the money I saved them from making those same, or similar mistakes again. If you’re going to buy into someone telling you how to make a million dollars, tell them to show you how they did it with what they are telling you to do, not how they did it selling folks on the idea of making a million dollars. Hire someone who walks their talk. Check their references beyond their testimonials page. Those were written while clients were still in the honeymoon phase. See if they’re still happy with the product or service years later. Free is one of the most expensive mindsets you can have! Don’t try to do it all yourself. Hire good help that you properly vet. Business costs. The lowest it will ever be is from doing it right the first time.